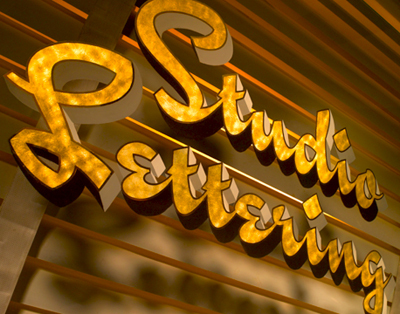 In the 2008 Type Directors Club design competition, I earned a number of awards for a trio of script faces which would ultimately become the Studio Lettering collection. The project began as an investigation into mid-Twentieth century reproduction lettering. My goal was not to imitate any particular style, but rather to question if the warmth and vitality of hand-lettering —shaped by the artist’s habits and preferences— could be successfully implemented within a typographic framework. In order to capture the liveliness of hand lettering, the collection makes use some crafty OpenType programming, courtesy of Tal Leming. Studio Lettering Swing, for example, contextually applies one of three variants; depending on their sequence, size and appearance, the glyphs change as the user types. Of course, these characteristics are by no means an American phenomenon. Specimens observed in international periodicals of the era reveal a similar spirit, one that defines the heyday of advertising lettering. Written language is also affected by regional customs, individual quirks or simple matters of convenience. 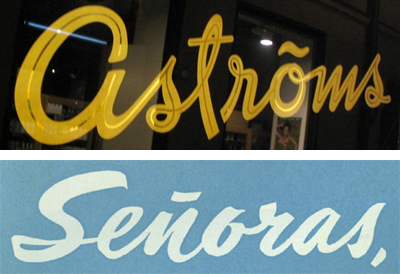 The top photo of the above pair of images shows a gilded storefront window in Stockholm; problem is, the o tilde is not part of the Swedish alphabet. Instead, the two dots of the dieresis have been represented as a wavy stroke, as it has become customary to do in writing. The image below it shows the Spanish tilde similarly simplified, this time as a straight stroke. As a response to this, all Studio Lettering typefaces feature culture-specific character sets that reflect stylistic preferences of native users. In many cases, the structure of the letters themselves change. To the right in the above setting is the default American English subset; to the left, the setting appears as it does in several European subsets. 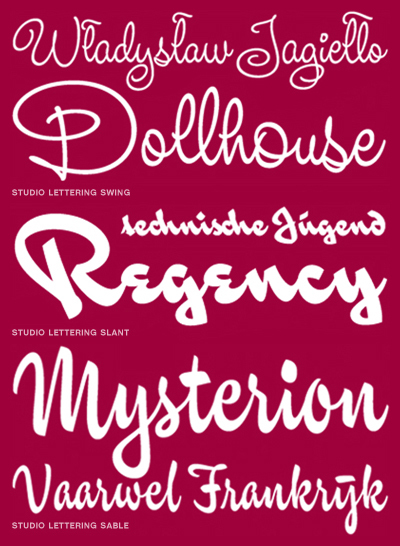 The Studio Lettering fonts also sport a whole bunch of other neat features. Check out the features page or browse the Projects section on the House Industries site for more info. If that’s not enough, there’s more behind-the-scenes on Tal’s blog.